Our half-day whitewater rafting trip is an awesome, quicker option if you want to sample exciting whitewater rafting in a short period of time. You will hit class 2, 3, and 4 whitewater rapids going through the most popular stretches of the Salmon River: Time Zone, Tight Squeeze, Black Rock, Ladder, and more. The exact loading and unloading sites change slightly depending on water flow, but our half-day whitewater trips typically start at Shorts Bar and ends at Lucille Boat Ramp. You will have time to relax and swim on the beach at the end of your trip. This is a 10 mile, 4-hour trip. For those who can’t get enough of the whitewater rapids that course through Hells Canyon, our full-day whitewater rafting trips are perfect. Over the span of 6-hours our river guides will take you through some of the Canyon’s most exciting rapids. The full-day whitewater trip includes lunch. Our full-day rafting trips start at the Spring Bar Boat Ramp loading zone and we’ll end our river adventure at Twin Bridges. If you really want to go on a larger river adventure in Idaho, we offer a 3-4 day whitewater rafting adventure which is the perfect combination of exciting rapids, calmer stretches of the river with beautiful sightseeing, overnight camping, and more. This whitewater rafting trip goes along the lower Salmon River, which is the most epic part of the river. This section is entirely roadless, so the only way out of the canyon is either with a jet boat or a raft. You will experience the ultimate combination of adventure and relaxation. The Salmon River is the largest undammed river in the lower 48 states, has beautiful white sand beaches, and endless opportunities for rare wildlife sightings. 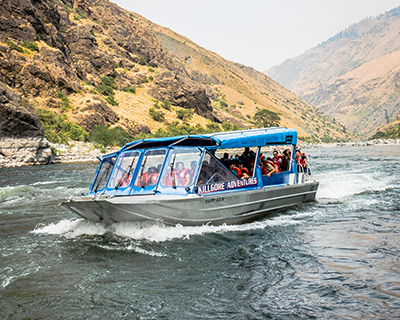 Our experienced river outfitters and guides will point out all the unique geological features along the Salmon River as you view steep granite walls along Hells Canyon, beautiful and lush canyon scenery, rare wildflowers, and more. You will hear unique stories of the American Indian heritage of the area, as well as the history of the abandoned mines and homesteads you pass by during the trip. On this multi-day river rafting adventure, you will go through exciting class 3 and 4 rapids, and it is the perfect rafting trip for families. At the end of this rafting trip, we pick you up on our world-class jet boats and will take you 32 more miles up the Snake River through Hells Canyon where we shuttle you over the mountain back to the Salmon River where you started. You make a complete loop on this trip going through two major rivers in Idaho. What Should you Expect Expect On Your Whitewater Rafting Trip in Idaho? What amount of time should they expect to spend rafting? Contact Us Today if you would like to book a rafting trip.